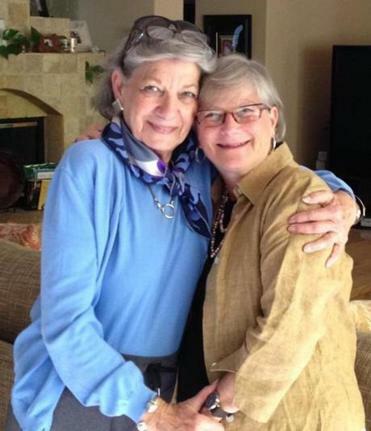 Debra Samuels (right) with her mother, Rona Greenberg. My mother, Rona Greenberg, passed away suddenly in January. It was only a week since I had last seen her; I had stopped in Los Angeles on my way back from a trip to Japan. A newly minted Californian, she had just moved in September from Miami, where she had lived for 40 years and was a successful interior designer into her 80s. Deliriously happy with her new digs in an “over 55” community, she quickly made new friends and finally lived close to her sons and grandchildren after many years solo. Rona was glamorous without being glitzy. Just three years ago she wore Jimmy Choos to my son’s wedding. My mom grew up in Brooklyn, amid a boisterous extended family. She came from a line of stellar Jewish cooks skilled in all the standards of simple, savory, and delicious Eastern European fare: beef brisket, kasha varnishkes (buckwheat groats and bowtie pasta), roast chicken, blintzes, and pickled herring. The food of my childhood in ’50s and ’60s New York combined the modern and the traditional. Bagels and lox were still exotic “insider” foods. A distinctly unadventurous eater, Rona kept few spices in her kitchen cabinet: salt, pepper, and paprika. Garlic was powdered and used sparingly, and parsley was the only fresh herb I ever saw. She made fluffy matzo balls that floated with carrots in a golden chicken soup. Her chopped liver was made with onions sautéed in schmaltz (chicken fat). Her noodle puddings were filled with cottage cheese, sour cream, and eggs, and the top noodles were perfectly browned and crunchy. For holidays she always made two: one with raisins and sugar for the Bloom side of the family, and a savory one for the Greenberg side. On Dec. 30, 2015, my brother George picked me up at the airport and took me to Mom’s apartment in a town 25 miles north of LA ringed with low mountains. I had just been there in September, when we helped settle her into her new place. My younger brother, Peter, was there to meet us. Rona cooked up a storm to celebrate our reunion. She burst into tears as her three children sat at the same white wrought-iron, glass-topped table we ate at as kids. She brought out two huge noodle puddings, farfel (toasted barley with sautéed onions), sliced turkey, challah, rye bread. “Mom, what are you doing? It’s just the four of us for lunch! You’re always over-cooking,” I accused. We tucked into the food of our childhood, and before you know it the table looked as though a famished crowd had descended on Apartment 316. One entire fluffy, sweet noodle pudding was gone, and we had started on the second. We couldn’t stop eating it. The texture of the noodles was otherworldly. This was a new recipe. “What’s in here, Mom?” I asked. 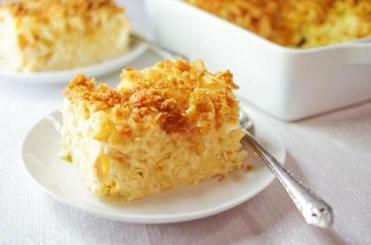 She told us: Cream cheese, melted butter, sour cream, apricots, a sprinkling of cornflake crumbs. “It’s my cousin Frances’s recipe.” Rona had made it in September for Rosh Hashanah, and it was a big hit. She pressed the remaining half on George. “Take it! Take it home for Wendy,” his wife. “No, Mom, we don’t need it,” George protested, but she ignored him and wrapped it in foil anyway. “Put it in the freezer and forget about it,” she said. He took it so there would be no more arguing. Back home in Lexington a week later, I got a late-night call from Peter that our mother had died of an apparent heart attack. Stunned and anguished, I boarded a plane at dawn to return to California. Our immediate families gathered at George and Wendy’s home, clinging to one another in disbelief. Numb and depleted after going through the details and business of death, we sat down in the kitchen. Friends brought food to help us through. Nothing appealed. But there on the table in the very foil Mom had used was the leftover noodle pudding. How could we have imagined eating it again so soon, and under such different circumstances? George had reheated it in the oven and cut it into sections. In silence, we each took a piece. Weeping, I tried to swallow the soft, custardy noodles with a hint of fruit. They just stuck in my throat. But I forced them down and managed to finish my piece. All that was left on the foil were the crumbs from the cornflake topping. Like little kids, we pressed our fingers into the crumbs and licked them until nothing was left. I never knew grief could be this sweet.